By the Numbers: Why Even Try? After last night, it seems pretty clear that the Eagles have hit the low point of Andy Reid’s tenure as head coach. The only question now is whether you have any hope that he can turn things around. I assume many of those folks who have stubbornly supported Reid over the last few games are starting to change their minds, but we’ll find out. 7.9 = Vince Young’s interception percentage this season. For comparison, Mike McMahon had a 3.9 percent interception rate in 2005. I’ve never seen a team get four second half possessions, and give the ball away in three of them. If Michael Vick is out again, Mike Kafka will undoubtedly get his chance next week. 57.9 = Young’s completion percentage this season, worst season of his career. What happened to quarterback gurus Andy Reid and Marty Mornhinweg? 6 = Two game stretches when Reid has had a worse point differential than the last two games. It’s one thing to get blown out by New England, but Seattle? 1 = Torn ACL for Colt Anderson. It’s not fair that one of guys who consistently plays the hardest had such a career-threatening injury in a meaningless game. 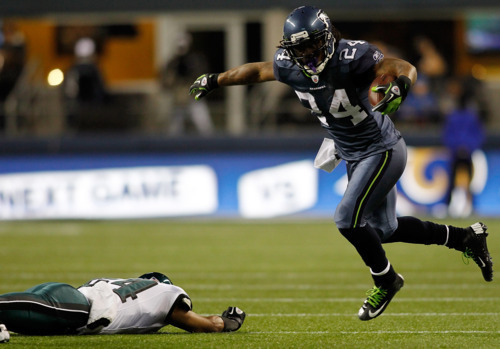 137.0, 6.7 = Tarvaris Jackson’s QB rating and Marshawn Lynch’s yards per carry from last night. What was that about the Eagles defense improving? 133 = Total yards from scrimmage for LeSean McCoy. Bright spot! 0 = Emotional reaction to yet another embarrassing loss. Tagged with Philadelphia Eagles, NFL, Seattle Seahawks, Week Thirteen, Andy Reid, Vince Young, Mike McMahon, Marty Mornhinweg, Colt Anderson, Marshawn Lynch, Tarvaris Jackson, LeSean McCoy. December 2, 2011 by Brian Solomon.